This month our Traveling Actuary Eve Hartridge takes us on a whistle-stop tour of Krakow, Poland's second most important city and certainly it's most fashionable. Krakow is rapidly becoming the go-to destination in Europe, closer than I thought with a flight time from London Gatwick of under two and a half hours. The picturesque city is located on the banks of The Vistula River and is steeped in history and culture dating back to the 7th Century. Those who have studied The Second World World War will know of it's significance and the tragedy that stuck this city 74 years ago. Today Krakow is a positive vibrant city, everyone that I met was friendly and very welcoming to me as a tourist. For the perfect city break,here are The Actuarial Post's top five suggestions for the first time visitor. The Galaxy Hotel is well located close to The Visula River and walking distance from The Jewish Quarter, The Museum Of Modern Art and The Oskar Schindler Museum. It is around a five minute taxi ride from the city centre which makes it convenient and rather peaceful. The hotel is popular with professionals as it is modern, spacious and well equipped. There is an on-site air conditioned gym and restaurant serving consistent high quality food throughout the day. Customer service was excellent and staff spoke good English as well as Russian. If you are pressed for time, a Segway tour is a great way to see Krakow and far less strenuous than cycling or walking the hills and cobbled streets. City Segway run a tour of Krakow and as is often the case, the guide was excellent. The tour lasts around two hours but longer trips can also be arranged. Starting in the town square, onto the university through the St Florian Gate in the old city walls, past the Wawel Castle, along the river and returning back via The Jewish Quarter the whole tour is extensive and significant stops are explained in detail along the way. No previous Segway riding skills required, although comfortable shoes are advisable. This may seem like a rather dull suggestion, however not only is this square utterly beautiful, it is also the largest medieval square in Europe and a UNESCO World Heritage Site. The Square is flanked on all sides by designer boutiques and delicious cafes which are perfect to explore in an afternoon. In the centre there is the old cloth market which remains as an indoor market area selling traditional crafts such as amber jewellery and wooden toys. Buildings to note are the Town Hall Tower, The Church Of St Wojciech and the St Mary's Basilica with its two striking Gothic towers. The Town Square is where most sight seeing tours start and end and very few couples can resist a traditional horse and carriage tour. 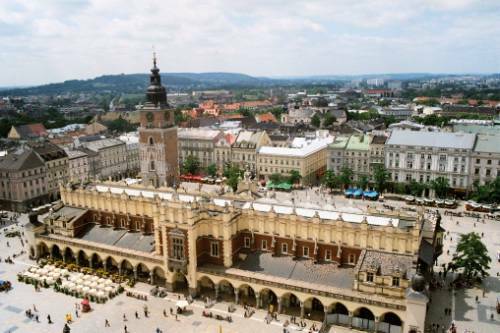 In Krakow you are spoilt for choice regarding where to eat, there are almost too many options. Traditional fayre can be quite heavy and typically served at lunchtime, it's worth noting that options for vegans can be limited. In the evenings lighter menus tend to be served with delicious salads a key feature, along with plenty of vodka. My pick of the restaurant was "The Piano Rouge". By day the restaurant inside and onto the square is packed with an eclectic mix of individuals enjoying anything from a perfect fillet steak to fresh pesto pasta. In the evening the venue transforms into a a sultry cavernous venue , themed on a Parisian boudoir serving fantastic cocktails and exquisite food to a live music soundtrack. The owner Max is the perfect host, originally from The UK he has made Krakow his home for over a decade. It is impossible to talk about Krakow without referencing Auschwitz. The former Nazi extermination camp is located around a hour from the city and although I'd never "recommend" a visit, I was very glad that I made the trip. Auschwitz is open all year round and to go early in the morning is the best time to avoid the school trip crowds, especially if your reasons for visiting run deeper than just that of a tourist. One of the most popular attractions just outside of Krakow is the Wieliczka Salt Mines. The guided tours can be a little lengthy however the trip is worth it to see some of the amazing statues and facilities ( a chapel and underground lake to name but two) that are located nearly 1000 feet underground. As a visitor you will educated on the history of the mines and assured that they are incredibly healthy due to the antibacterial properties of the salt. This month's Travelling Actuary takes us to the iconic Boston to experience New England at it’s very best. By Eve Hartridge connect with Eve at www.allaboutevie.com The last couple of years have certainly put the "great" into Great Britain.